I was lucky I had my camera with me when having a cup of coffee in my backyard and this little bird came up . 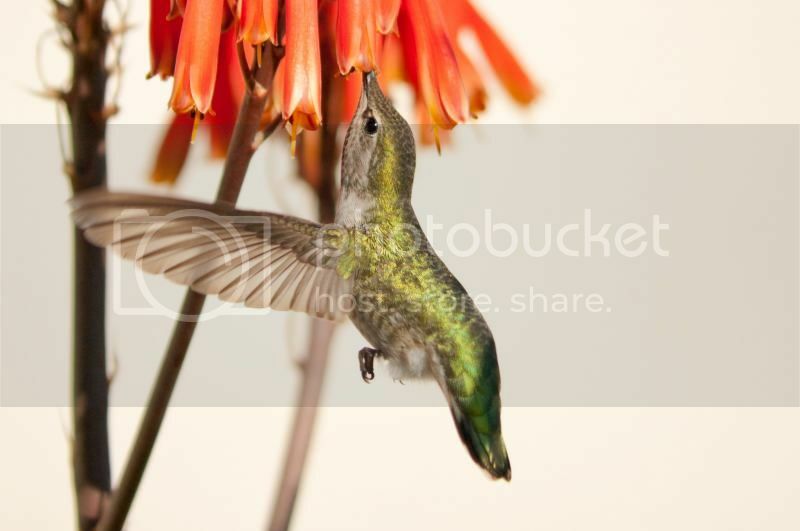 Great Hummingbird series and that last one is a HUMDINGER! any idea what setting (exif) were used for this shot? Those are outstanding shots, that last one especially!. Thanks all for looking and commenting - much appreciated. I had the the camera on TAv, set with 1/3200" at f/5.6 and Auto ISO (which limit at 1250). I think the Exif data is still intact . Simply wonderful. Very beautiful, the last one as another poster noted - is superb. Thanks for your commenting, Matiki. Btw, yesterday, at the same spot, I managed to get few shots of the different one. Now I know that my next lens will be the DA 55-300! No comparison to what I get with my Tamron purple monster. Gobsmacked! Clearest pictures I've seen of a hummingbird yet. What was the shutter speed etc? These are great! Now, I've got the lens. I've got the camera. But what are those flowers? The hummers are obviously nuts over them. I've got to order them for the spring and put them in MY backyard. I doubt that I'll do as well as you, however. Is this an "Allen's Hummingbird?" Source: Roger Tory Peterson's Field Guide to the Western Birds. Thanks all for enjoying the images and your nice comments. Justin, the shutter speed used for the first 4 was 1/3200" with aperture f/5.6. The last 2 with 1/4000" with f/6.3. The ISO varied as I had the camera on TAv. Mike, I am sorry since I have no clue what those flowers are . I love this lens so much .